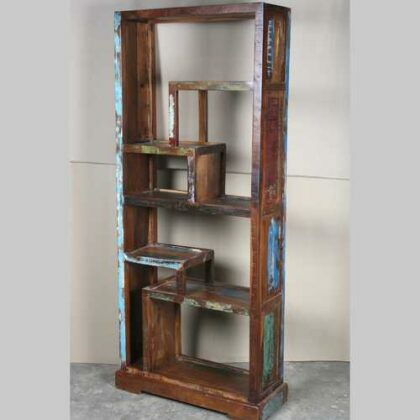 Colourful bookshelf with quirky shelves made out of reclaimed timber. 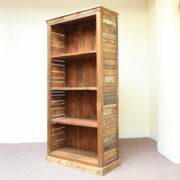 Need something a bit different for storing books, ornaments, plants or other bits and pieces of different sizes? 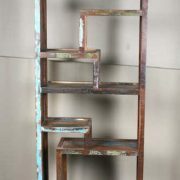 Look no further than these quirky bookshelves. 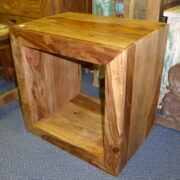 Made from reclaimed timber, the colouring of each of these pieces will be slightly different. Each follows a similar style, however. 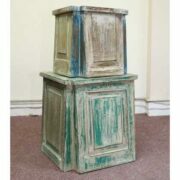 Expect to see large swathes and subtle flashes of colourful distressed paintwork working in combination with different shades and textures of natural wood grain to create a mottled, vibrant finish perfect for those who prefer a more rustic look within their home. 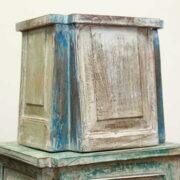 Colours of paint usually include (though not exclusively) blue, green, white, cream, red and orange and the wood is mostly finished in a darker brown stain. 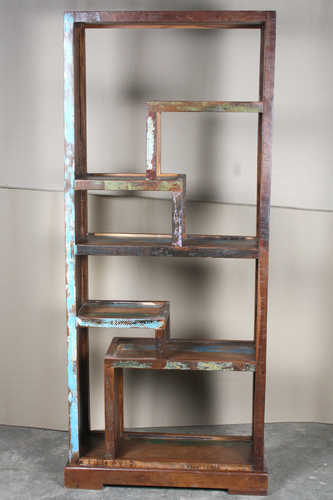 Each bookshelf has exactly the same design with regard to shelf placement, with variously sized platforms for displaying many differently items. Picture plants and fish tanks interspersed with books and ornaments to create a homely display of character. 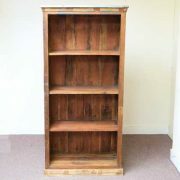 These bookshelves each have panelled sides and a certainly built to last, sitting on top of a thick hardwood base. Perfect for your living room, hallway, lounge or bedroom, these quirky bookshelves offer something a little different for your home.